Run Hyper-Terminal in Windows by going to Start > Programs > Accessories > Communications > Hyper-Terminal. Hyper-Terminal prompts you to create a new connection. Note that this is not required but let’s go ahead and do it. 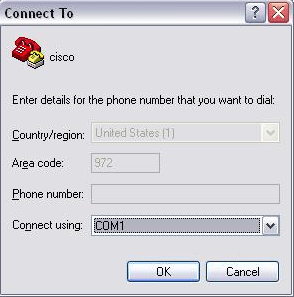 Type in the word cisco for the connection name and click OK.
Connect your Cisco device to your PC’s COM1 port but don’t turn it on yet. 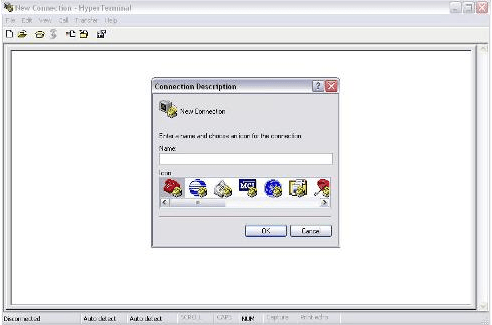 On the next window that appears, make sure that the “Connect Using” field says COM1 and click OK.
You have successfully configured HyperTerminal and connected to your Cisco device. When you are done and try to close out Hyper-Terminal, you will be asked if you want to save this connection. I suggest saving it with the name you gave it, cisco, so that you don’t have to configure it again next time. Hyper-Terminal can also be used to telnet to your Cisco network devices once they are configured with an IP address and are on the network. Thus, you don’t have to stop using Hyper-Terminal once you have configured your device. Hyper-Terminal can be used to paste Cisco commands into your device so that you can more quickly configure devices. For example, you can do a show running-config, copy the output to the Windows clipboard, paste it into notepad, edit parts of it, and paste it back into your router’s configuration. 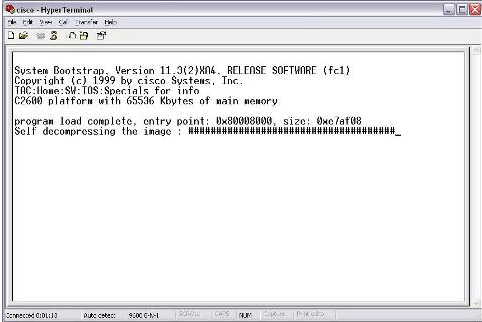 Hyper-Terminal can also log anything that scrolls by on the window to a log file, for record keeping or analysis.